Deadheading isn't violent and it has nothing whatsoever to do with the Grateful Dead. It's the practice of snipping dead and faded blossoms off flowering plants to freshen up the garden. Deadheading hydrangeas (Hydrangea spp.) should include a treasure hunt for new buds. Deadheading hastens the appearance of fresh hydrangea blossoms. Say what you will about the wonders of foliage, most gardeners hope for fresh flowers in a summer garden. 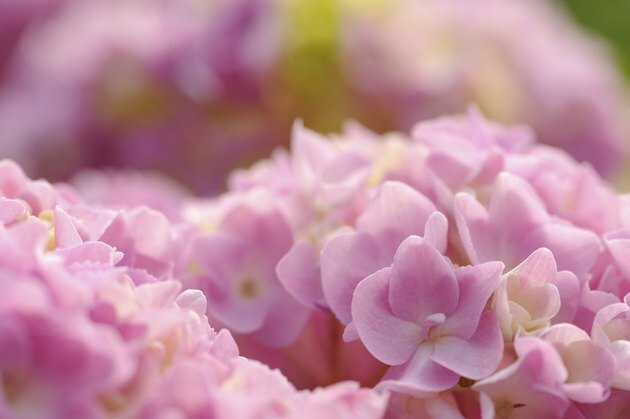 Accomplish this by planting long-blooming perennials like hydrangea shrubs in U.S. Department of Agriculture plant hardiness zones 4 through 9. You get even more flowers by clipping off old, fading blooms. Deadheading focuses a plant's energy on growth rather than seed production and keeps it looking its best. Because hydrangea blossoms are so large, removing the dying flowers makes an enormous difference immediately. Pruning is tricky with hydrangeas. Some species flower on old wood, some on new growth, and the pruning season for each is different. Deadheading lets you avoid these timing issues, since only dead blossoms are removed. It's a maintenance practice that you should do from spring through autumn, as long as your species of hydrangea flowers. The exact moment to clip a fading flower depends on personal preference. When you think it is no longer attractive, get out the pruners. You may need to deadhead more often after periods of heat or heavy rain that damage blossoms. When you've identified hydrangea blossoms with their best days behind them, clean your pruners with a rag soaked in denatured alcohol. Wipe the cutting blade before each snip to make sure you aren't spreading disease. To figure out where to make the deadhead cut, go to the first faded blossom and follow the stem down to the sets of leaves below it. Look for a pair of swollen flower buds along the stem near the first or second set of leaves. Snip off the stem just above these buds. If you start to deadhead and want to snip more, first figure out whether your shrubs bloom on old wood or new wood. The most popular hydrangea species bloom on old wood, including bigleaf hydrangeas (Hydrangea macrophylla) that thrive in USDA hardiness zones 6 through 9. Although you can deadhead any time, only do additional pruning before mid-July. Flowers that bloom on new wood can be pruned as late as winter. The bigleaf cultivar Endless Summer (Hydrangea macrophylla "Bailmer Endless Summer") is hardy in zones 4 through 9 and blooms on both old wood and new wood. Deadhead it throughout the blooming season, but limit other pruning to early spring.